The Fills Monkeys are: Yann Coste and Sebastien Rambaud. 2 incredibly skilled drummers from France. In a nutshell, these guys do not “play”the drums they play with their drums! This duo is our favorite musical act so far at the Zoofest 2014. If you’re into drumming and impressive aim, this duo is for you. 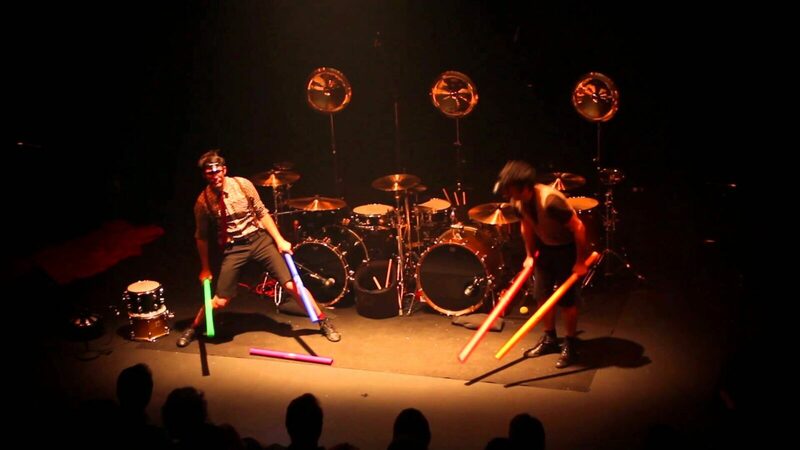 With gimmicky fun like glow sticks and drumming with a variety of objects, the audience can enjoy various beat sounds from the creative French men. These guys are equally good at air-drumming, a feat one would think is easier than it looks but it takes a very special ear, let alone 2 ears, to make this ensemble a success. Not only do the fils Monkeys have to time themselves but be ultra aware of the other ones timing. My favorite feat was a simple but truly satisfying one, where each guy throws a tennis ball with his drum and they ping-pong back and forth in perfect delay. This requires a phenomenal amount of practice, as the simple act of ponging the ball too far, will result in a delay in the beat timing and will affect the sound of the drum. Another great aspect about this show is that it’s family friendly and for all ages. If you are stuck with in-laws visiting and do not want to offend them, (or spend too much talk time with!) this is the perfect show as there is not much to discuss after the show.